All heavy gauged steel construction and manufactured with steel inner walls for extra strength and durability. Heavy-duty 45mm ball bearing drawer slides provide superior performance and carry heavier loads. Full height rear locking mechanism, locks full-length drawers in multiple locations. Added security provided by tumbler lock, supplied with two folding keys. Rust and solvent resistant powder coat paint finish. Overall Size: 1680 x 465 x 1005mm. Large Drawer (x1): 1570 x 405 x 105mm. Small Drawer (x5): 1200 x 405 x 50mm. Large Drawer (x1): 1200 x 405 x 130mm. Small 1/2 Drawer (x4): 325 x 405 x 50mm. X-Large 1/2 Drawer (x1): 325 x 405 x 235mm. 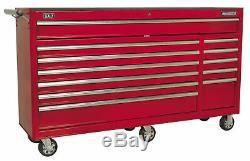 Sealey Ap6612 Rollcab 12 Drawer With Ball Bearing Runners Heavy-Duty - Red. Includes six extra heavy-duty 125mm PU/PP alloy wheels, two fixed wheels and four swivel castors two of which are lockable. Features a highly polished chrome handle to enable smooth manoeuvrability. Also includes a 10mm thick top mat. Each drawer features aluminium drawer pulls and non-slip liners. Specification (W x D x H). World of Supply is a UK-based online distributor of leading-brand engineering, DIY and business consumables. Our site located in the heart of the UK houses both our administrative and warehousing facilities. Our team is very experienced within the online realm, we can turn around products extremely efficiently at an affordable price. We can offer high quality support on your journey with us. World Of Supply - Tel: 0121 585 5920. Shelah Rd, Halesowen B63 3XL. The item "Sealey Ap6612 Rollcab 12 Drawer With Ball Bearing Runners Heavy-Duty Red" is in sale since Tuesday, January 22, 2019. This item is in the category "Home, Furniture & DIY\DIY Tools & Workshop Equipment\Tool Boxes & Storage\Other Tool Storage". The seller is "worldofsupply" and is located in Halesowen. This item can be shipped worldwide.